As we already reported to you a few weeks back Luciano’s ground-breaking label will be holding a very special, festive showcase. The party was scheduled to take place at Pulse in SE1 but has recently been shifted to Electric Brixton (formerly The Fridge). Christmas has come early as we now have some free tickets to give away! 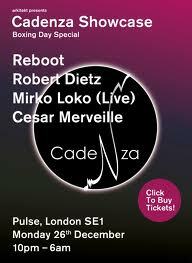 Having previously been hailed by Beatport as one of 2009’s ‘Ones To Watch’, Robert Dietz has made good on this promise; Releases on esteemed imprints Cecille and Running back (as well as much-vaunted releases on Cadenza) have made Robert one of the most sought-after artists in the underground house scene, so who better to back up Reboot for this special party. As if this wasn’t enough, Mirko Loko will be bringing his live show to town. Expect exclusive cuts and unreleased productions from this Maestro… should be special. Electric Brixton has a stunning theatrical main room with excellent sound, air-con and will provide the perfect setting for the Cadenza family to flex their musical muscle. We will combine the FB attendee list and emailed names and then pick a name at random on Thursday 22nd December… Good luck!